Grants Removals & Storage Ltd is an established family run firm that has worked alongside Goodfellows Estate Agents for the past 15 years. They offer a friendly, professional service that relieves the stress of changing address! 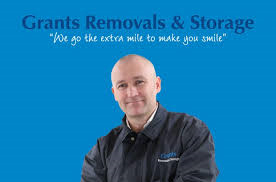 Hello, I’m Del Grant, owner of Grants Removals & Storage Ltd. If you are looking for a trustworthy reliable Removal Company to take care of all your removal needs, please give us a call. Being a family run firm we understand the importance of how moving your home or office can be a stressful time for all concerned. We make it our priority to ensure your move goes as smoothly as possible by having a helpful friendly team on hand, which really can make all the difference to your moving experience. Our staff are hardworking, conscientious, uniformed and professionally trained in all aspects of your move. In the 20 years we have been a removal company serving the Surrey and South London area we have built up a reputation for honesty and reliability that is second to none. I’m a firm believer in good customer service and have personally trained my team to ensure your move is undertaken in a professional and stress free manner. Our fleet of modern purpose built vehicles, ranging in size from Luton vans to 35 ft container lorries are equipped to handle any job. We serve the whole of Surrey and South London and are able to move you locally or long distance. Please call our office to speak to me or one of my team now on 0208 640 6885 and let’s get you moved! To arrange a FREE no obligation quote or to find out more about Grants Removals & Storage Ltd and our services please complete our enquiry form by clicking on the link above or call 0808 100 1960.